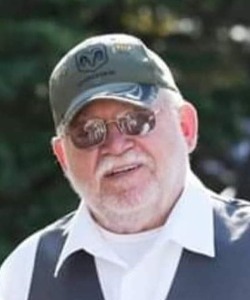 Donald “Don” M. Tritt, age 71, of Omro passed away Saturday, March 9, 2019, after a brief battle with cancer. He was born April 30, 1947, in Oshkosh to the late Harold and Evelyn (Collins) Tritt. Don was a 1965 graduate of Omro High School. From March of 1966 until January of 1970 Don was in the U.S Air Force, serving in Vietnam from June ‘68 to July ’69 with the 820th Detached Unit/Red Horse. On October 21, 1978, he married Judith Thull in Berlin. Don was employed by Hoffmaster, in Oshkosh for 32 years, until his retirement. He enjoyed sturgeon spearing, hunting and fishing trips up north with Phil and Jim, and making maple syrup in the spring. Don was a member of the American Legion; Daugherty-Hamilton Post 234 in Omro; and proudly served on the legion honor guard. He was also a founding member of the Eureka Belt Busters Snowmobile Club, and was a member of a group that shot off the annual fireworks at Soo Lake in Phillips. Don was a past winner of the Crandon Brush Run, and was named the Post Crescent Master Angler for King Chinook Salmon. Don is survived by his wife of 40 years, Judith Tritt, of Omro; daughter and son-in-law, Shannon Tritt-Coulthurst and Matt Coulthurst, of Neenah; a sister, Judy Tritt Richey, of Oshkosh; two brothers and sisters-in-law, Tom and Paula Tritt, of Eureka; Jerry and Linda Tritt, of Borth; in-laws, Jean Knoblauch, of Oshkosh; Jane and Barry Dieser, of Reno, Nevada; Jaci Thull, of Oshkosh; and several nieces, nephews, other relatives, and friends. Along with his parents, Don was also preceded in death by his father-in-law and mother-in-law, Jim and Ellie Thull; and a niece, Amy Knoblauch. A visitation for family and friends will be on Friday, March 15, 2019, from 1:00 to 4:00 p.m. at Mueller Funeral Home 904 E. Main St. Winneconne. A funeral service will be held on Friday at 4:00 p.m. at the funeral home. Following the service burial with military honors will be held at the Oak Hill Cemetery, Poygan. So sorry for your loss. I graduated from high school with Don. So sorry for your loss worked many years with Don at Hoffmaster’s. Great guy.. I am so sorry to hear of Don's passing. I'll miss our talks and that delicious smoked fish he was so kind to share. Judy and Family, So Sorry for your Loss. Our thoughts and prayers are with you! Judy, Shannon, and Family, So sorry to hear about Don. Please know that we are thinking of you and praying for you.